The LFC injury news delivered in Jurgen Klopp’s press conference today was very positive on the whole. According to Sky Sports, Liverpool manager Klopp confirmed that Georginio Wijnaldum, Adam Lallana, Dejan Lovren and Nathaniel Clyne are all in contention for Monday night’s big game against Manchester United. The same source also reported that defender Joe Gomez has resumed training after a long lay-off. 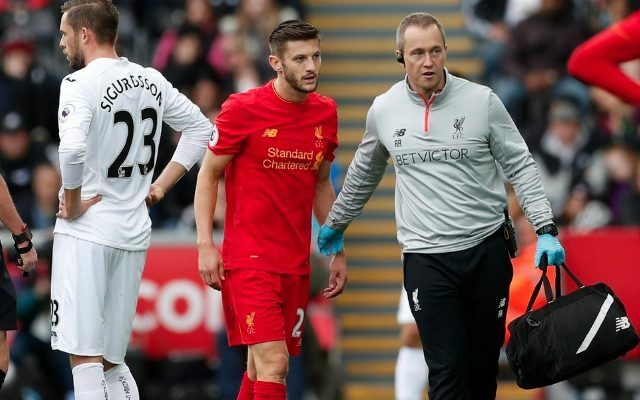 Lallana, Lovren and Clyne all missed out on the chance to play for their respective countries during the recent international break because of various injuries. Meanwhile, Wijnaldum did feature for Holland, but was forced off with a hamstring problem during Monday’s 1-0 defeat to France in Amsterdam. Lallana has been a big player for Liverpool this season. In fact, the former Southampton star has arguably been his side’s star man, contributing three goals and three assists in seven Premier League starts. Clyne and Wijnaldum have also started every league game so far this term, while Lovren has only missed two matches.